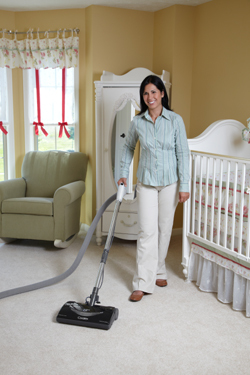 Since 1984, VACUFLO Central Vacuum Systems have been providing consumers with whole-house cleaning power and convenience. VACUFLO Central Vacuums offer numerous benefits including patented Cyclonic Filtration Technology, unique hose management solutions, improved indoor air quality and the industry's most comprehensive Lifetime Limited Warranty. Discover why VACUFLO is the right central vacuum for your home and explore the benefits of central vacuums over portable vacuums. You may think your portable vac is doing a good job, but you'll be surprised at how much more powerful a central vacuum is!